Among other things. But, other than the fact that I am swamped with work trying to pull of my public art project, I have been irrevocably stuck on the digital installation I wrote about earlier. I tried to keep the project simple, but it does require coding. And, for someone like me, who is absolutely new to it, it can be quite befuddling. So I’m resorting to writing about it here on the blog, hoping to clear my mind a little. What is this digital installation all about? From the beginning of this Masters the question I have been confronted by is: what part does the audience play in the creation or understanding of art? Social media has allowed artists a new way to exhibit artwork and interact with the audience, but has that also dumbed down art? Do we seek likes and appreciation over pursuing a concept? Do we feel the need to commercialize and produce art at a fast rate simply so we can keep our audience engaged rather than spending years pouring over a single work, following our artistic instincts to the end? Ultimately, the question remains the same. What part does the audience play? If a painting is already complete do they play a part at all? So this digital installation seeks to be incomplete without the audience’s input. It seeks to give the illusion of artistic power in the hands of the audience. What will happen in this installation? The idea is that the audience will be confronted by a blank screen and a small microphone. They will speak into the microphone (positive associations related to Karachi) and their words will unlock a painting on the screen. The painting will be a digital animation projected onto the wall but it will only appear as they speak. When they stop speaking it too will stop. Then the next person with their story will carry on the story of the painting. And the viewers together will build the artwork. I am creating a digital painting using photoshop. At first I tried to auto animate it using blender, but that wasn’t working out too cleanly so the next idea is to save the .png layers as I paint and use imovie to compile a stopmotion animation. For the mechanical aspect I am using processing to turn the video on and off. 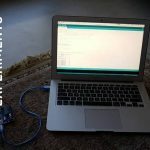 The computer will be connected to an arduino (whose code I am struggling with) which will communicate through the serial port to processing telling it when to play or pause. The arduino will be connected to an Elechouse VR3 voice recognition module, pre coded with commands using USB-TTL FTDI, coolterm and hexcodes, which is what the viewers will speak into. So I’ve got all the parts down except how to code the arduino to send messages to processing. And it’s really bugging me. It’s one of those times when the inability to finish an artwork preys on your mind, not letting you move onto other things that need doing. I am feeling the gnawing need to finish this first. And I can’t really let it go either, because one must see an experiment through to find out what was done right or wrong, right? I’m trying to partner with an engineering student via google hangout to work this out. I found her through a friend who happens to be a lecturer at a University. Fingers crossed as to whether we’ll be able to solve this. Receive the latest news, art inspiration, activities and more straight to your inbox.